The social media assignment has been my favourite of all on the journalism unit. It has been a real challenge, to say the least, but I feel it has been a really worthwhile (and addictive!) experience. Each week after every lecture I planned a blog around what I had learnt in an attempt to pass on my ‘knowledge’ to my followers. It has been a great way to really learn and process the information I’ve been taught. My blog is also used as an online portfolio which is perfect for showcasing my degree work, for example features and news reports, to potential employers. Since updating my blog regularly, I have seen such an increase in the amount of hits I get each day. 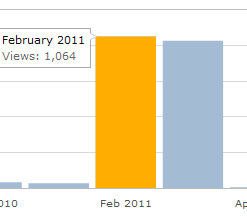 February and March have each had over 1000 views so, surely I must be doing something right? The next step for me is to encourage interactivity on the blog, for instance, discussions around each of the posts and perhaps incorporating polls. However, since linking my blog with my Twitter account I have had those from the media industry retweeting blogs they have particularly enjoyed. It would seem that this is what is predominantly driving the traffic. Using Twitter every day for journalistic purposes has also been rewarding as I am always up to date with the national, local and media industry news. As a communication student this is exactly what we need to be doing so sharing it will just help others. I also find that following the likes of BBC, Media Guardian and industry professionals is also a great source of information and they often have relevant news to retweet or reply to. I’m still a beginner at all of this but I am definitely going to continue long after my uni days. I would recommend this blogging experience to anyone. Check out ‘The Twitter Challenge’ blog for more advice on using social media and the benefits of doing so.